Few properties in Michigan were held by one extended family for ten score years or more. This is one of them. On July 6, 1776, when Michigan was a British colony and just two days after the Declaration of Independence was signed in Philadelphia, William and Alexander Macomb purchased Grosse Ile from four Indian tribes. John Anthony Rucker came to Grosse Ile on January 20, 1819 from the East. He apparently sailed to the Detroit area on the second trip of the first steam vessel on Lake Erie, the Walk-in the-Water. Robert Fulton successfully applied steam power to ships in ____, but his early vessels were river boats. This ship was built at a site near Buffalo in 1818 and provided service from that city to Detroit. After the Erie Canal opened in 1825, it became much easier for east coast residents to migrate to Michigan. It involved, however, a very long, slow trip from Albany toward Buffalo on the Erie Canal followed by a steam ship trip across the shallowest of the Great Lakes. Mules just did not march along rapidly. John Rucker married Sarah Macomb, a sister of the son of William Macomb. He then bought or obtained a farm on the west or mainland side of Grosse Ile. Perhaps John Rucker selected this location for his residence because his wife did not want to live on the Detroit River side of Grosse Ile. 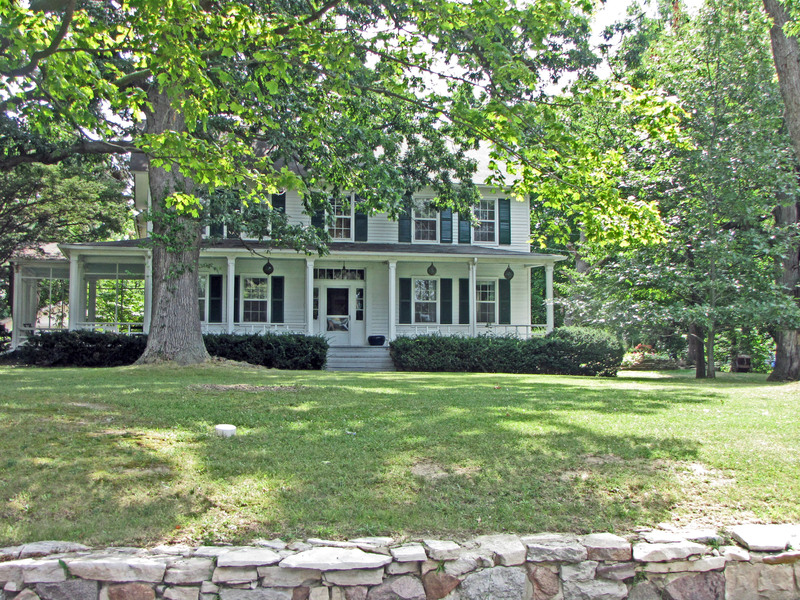 There was a log home on this property that had been built by Mr. Chittenden in 1816. About twenty years later, Mr., Chittenden’s log home was replaced by the very appealing residence that you see pictured above. This is a rectangular vernacular structure with clapboard sheathing. It is a two-storied home with an attractively gabled roof. The rear wing was added in 1898, and at that time, the home may have been substantially remodeled. I am not certain that the original structure closely resembled what you see above. I do not know how long John Anthony Rucker and his wife, Sarah Macomb, lived in this home. In 1873, it was sold to Mr. Rucker’s cousin, Robert Lee Stanton, so that the widowed Alexandrine Macomb—a daughter of Alexander Macomb who proclaimed himself a hero of the War of 1812 and who is memorialized by an impressive statue at the intersection of Washington Boulevard and Michigan—could live her in her older years. 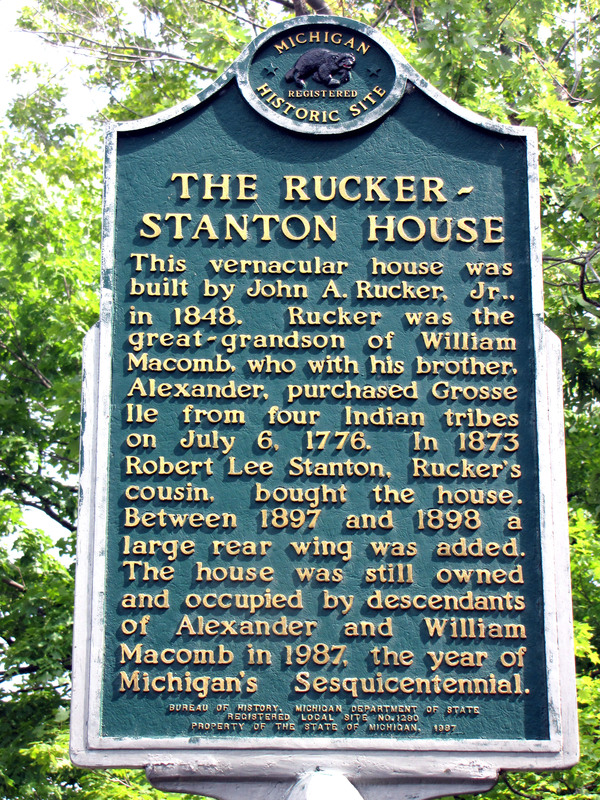 This home remained in the Rucker and Stanton extended families at least until 1987. This is impressive home, partly because of the very nice array of elderly trees that surround it.